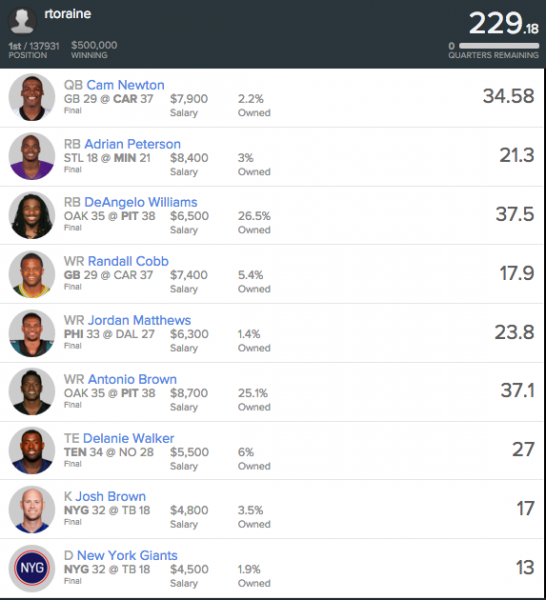 FanDuel user rtoraine took down the grand prize with a monstrous day from a pair of Pittsburgh Steelers and strong performances from a bunch of low-owned plays. The lineup had two popular plays (DeAngelo Williams and Antonio Brown), but seven strong low-owned plays that really put it over the top. Rtoraine went with a "naked" Cam Newton at QB, but did employ a kicker-defense stack. Every player scored two points per $1,000, with seven eclipsing three points per $1,000. In a week where a lot of the chalk did well, rtoraine differentiated with a whopping seven players owned six percent or less. I want to point out something I've become increasingly aware of this season: there is no need to avoid certain pairings of players on the same team just because they have a slightly negative correlation. In the Sunday Million, many entrants rostered Williams or Brown separately, but not many entrants rostered them together -- presumably because of the slightly negative correlation between a team's RB1 and WR1. However, there are situations where Brown and Williams -- or any RB1 and WR1 -- playing well can have a synergistic effect on each player. Every time Brown or Williams picks up good yardage and moves the chains, the new set of downs means more opportunities -- in the form of at least three more downs -- for both players to continue to rack up fantasy stats. By the same token, every yard the RB1 or WR1 gains moves the team closer to the end zone. The closer to the end zone that a play starts, the higher the liklihood of a TD for every member of the offense that is on the field. So although Williams and Brown technically cannibalize eachother's TD upside, both players are much more likely to each hit paydirt on a team that totals five TDs in a given game than one player is likely to hit paydirt on a team that scores only twice, for example. The negative correlation between RB and WR (-0.07)1 is so slight, it's almost completely irrelevant. Furthermore, blindly avoiding all negatively correlated pairings also fails to account for salary and value. For example, if you like a RB and a WR on the same team and they're both minimum-priced, would you think twice about rostering them? Probably not. You'd intuitively know that even though the players have a slight negative correlation, it would be pretty easy for both of them to return great value given their individual price points. Well, that happened with Williams and Brown. Sure, Williams's upside was "capped" in that he couldn't produce on any of the 25 plays that went to Brown. By the same token, Brown's upside was certainly "capped" in that he couldn't produce on any of the 31 plays that went to Williams. However, the point at which upside was capped in both cases was way beyond what you needed from each of those players to return value. While Williams and Brown had a record-setting day that other duos will be hard-pressed to repeat, it's certainly realistic for a RB and WR to both go over 100 yards and score a TD in the same game, especially if they're both high-volume players who see a large share of their team's overall workload. Depending on each player's cost, both could independently return three or more points per $1,000. I would not purposely seek out negatively correlated pairings, but I would not avoid them, either. If both players profiled as strong values individually, and I thought there was a realistic chance that both could return three or more points per salary dollar, I would not hesitate to pair them up. With that said, let's get in to some of rtoraine's other difference-making plays. Why He Was Low-Owned: With a lot of other options at the position, Cam simply got overlooked in a game that not many users owned shares of. Hindsight Bias: No hindsight bias was need if you read 4for4's FanDuel Week 9 GPP Breakdown, where I pointed out that Cam Newton had a very realistic path to a top-five QB finish. Why He Was Low-owned: The Rams defense had been stout, and there was so much value at RB that many users didn't pay up at the position. If they did, they went with shiny new toys Devonta Freeman or Todd Gurley. Hindsight Bias: Still possessing generational talent, Peterson was third in the league in total carries and rushing yards coming in to the game. The Vikings were home favorites. Coming in to Week 9, the Rams defense had played lights out at home, allowing 3.1 yards per carry, but struggled on the road, allowing 4.5 yards per carry. Why He Was Low-Owned: Fighting through a nagging shoulder injury for the majority of the season, Cobb simply had not produced since a three-touchdown outburst in late September against the Chiefs on Monday Night Football. Hindsight Bias: Cobb was another player highlighted in the FanDuel Week 9 GPP Breakdown, where I pointed out that Cobb's price was down considerably and he had a juicy matchup with the Panthers' only weak link at cornerback, Bene Benwikere. Cobb beat Benwikere for a 53-yard TD on a wheel route early in the third quarter. Why He Was Low-Owned: Like Cobb, Matthews had been unproductive since September. Both the Cowboys and the Eagles defenses were playing well, setting this game up as a likely defensive slugfest. Hindsight Bias: Matthews's price was down $800 since Week 1, and word was that he was finally over a hand injury that had been plaguing him. I've done extensive research showing that targets are the best predictors of fantasy scoring, and Matthews led the Eagles in targets by a wide margin entering the game. Why He Was Low-Owned: With Rob Gronkowski and Antonio Gates in good spots and Ben Watson coming off a big game, Walker went under the radar. Hindsight Bias: Walker had been extremely consistent this season, with four games with at least six catches coming in to Week 9. The Titans new head coach, Mike Mularkey, was formerly Walker's position coach. Our aFPA metric would have came in handy, as it had the Saints ranked 28th against TEs. How Did the Most Highly Owned Plays of the Week Fare? Brady coasted to a 299-yard, two-touchdown day, which is a very good performance for any QB. However, at $9,500, you needed Brady to be more than "very good". Only able to amass 12 yards on 12 carries, Freeman was let down by his offensive line in San Francisco to the point where the team eventually had no choice but to abandon the run. His impressive 8-67-1 line in the passing game barely got him to two points per $1,000, but he needed a lot more to be a difference-maker, especially with a bunch of inexpensive RBs putting up strong fantasy performances. A popular play due to strong showings with heavy volume early in the season as a starter, Williams again racked up a ton of volume. He parlayed 31 touches into 225 yards and two TDs, adding two receptions and a 2-point conversion. The Raiders were one of the worst pass defenses coming in to the game, and had no one capable of keeping up with Brown, who racked up 17 catches and 284 yards to go along with 22 rushing yards. Beckham had a good game with nine catches for 105 yards, but failing to reach the end zone at a $9,000 price tag usually won't cut it in a tournament. Jeffery struggled early with the coverage of standout cornerback Jason Verrett, but started to eat after Verrett was forced from the game with a hamstring injury. Continuing to be funneled the ball by offensive coordinator Adam Gase, Jeffery finished with a 10-151 line. Nearly seventeen percent of the field was a week late to the party with Watson, who had a solid-but-unspectacular 5-60 line and failed to reach the end zone. It is worth noting that Saints TEs Josh Hill and Michael Hoomanawanui both scored short TDs that surely tilted Watson owners. While I was initially critical of the Colts for firing offensive coordinator Pep Hamilton, it looked like the right decision in the team's 27-24 win over the Broncos. Denver recorded only one sack and failed to notch a single turnover, with their only saving grace being an 83-yard punt return TD by Omar Bolden.